It’s often confusing to see people not knowing the difference between a body lotion and a body butter. 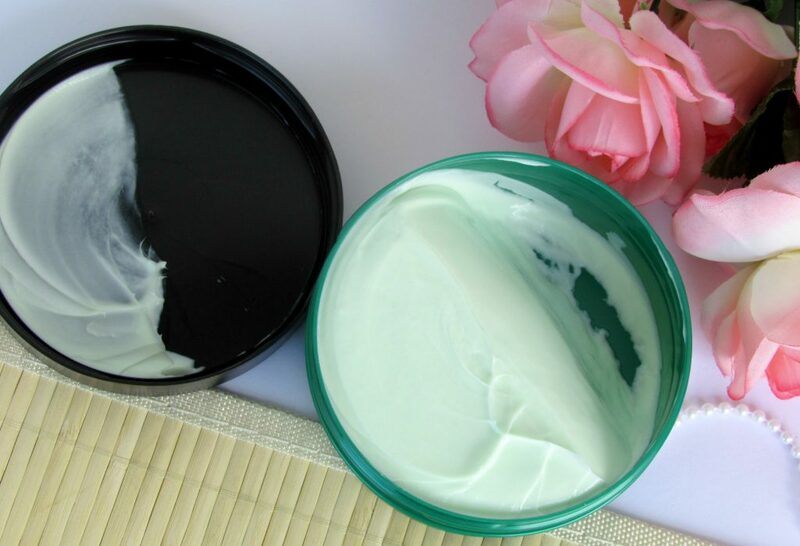 Body Butters a rather whipped cream like product which provide lighter and easier application. It is designed to provide intense, long-lasting moisturizing effect for your skin. Body butter is composed primarily of oils and butters. It helps nourish and moiturise the skin. Your skin becomes visibly smoother & silky soft. Body body vs lotion is one of the biggest mystery among a lot of people. The answer lies in the ingredients and composition. By definition, lotion contains water. Some lotions contain up to 70% water. While we all understand that our bodies need water, If water is spread on our skin, it dries quickly and our skin start to become dry. Lotion tries to minimize this by adding in moisturizing agents and other ingredients. But our skin knows the difference and all too often the lotion wears off quickly and leaving us with nothing, but the dry skin. 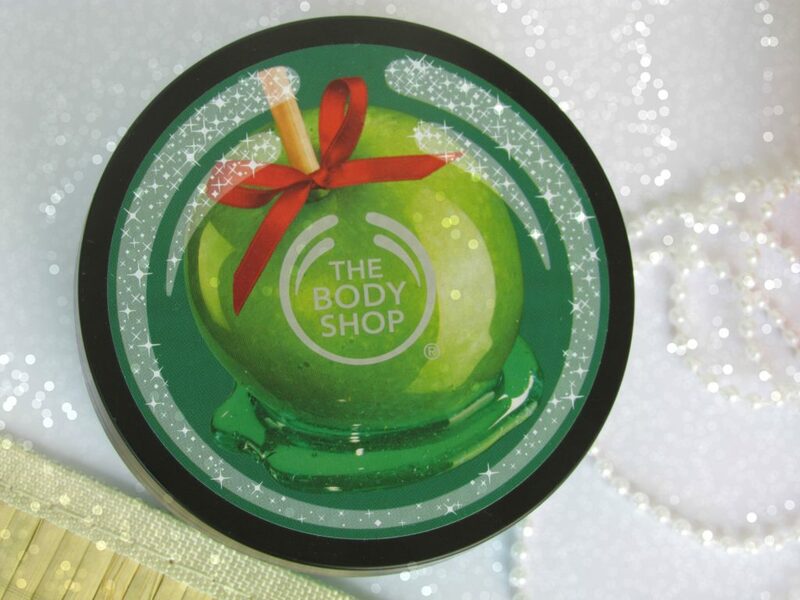 The Body Shop’s Glazed Apple Body Butter is a rich and delicious-smelling festive treat for softly-sweet skin. This mouth-watering collection contains Alpine apple seed oil from green apples grown in the orchards of the Italian Alps, well known for its hydrating benefits to the skin. Aqua/Water/Eau (Solvent), Butyrospermum Parkii Butter/Butyrospermum Parkii (Shea) Butter (Emollient), Sesamum Indicum Seed Oil/Sesamum Indicum (Sesame) Seed Oil (Emollient), Glycerin (Humectant), Cetearyl Alcohol (Emulsifying Agent), Glyceryl Stearate (Emulsifying Agent), PEG-100 Stearate (Emulsifying Agent), C12-15 Alkyl Benzoate (Emollient), Ethylhexyl Palmitate (Emollient), Glycine Soja Oil/Glycine Soja (Soybean) Oil (Emollient), Cera Alba/Beeswax/Cire d’abeille (Emulsifier), Dimethicone (Emollient), Pyrus Malus Seed Oil/Pyrus Malus (Apple) Seed Oil (Emollient), Sucrose (Humectant), Theobroma Cacao Seed Butter/Theobroma Cacao (Cocoa) Seed Butter (Emollient), Orbignya Oleifera Seed Oil (Emollient), Parfum/Fragrance (Fragrance), Caprylyl Glycol (Skin Conditioning Agent), Phenoxyethanol (Preservative), Xanthan Gum (Viscosity Modifier), Tocopherol (Antioxidant), Disodium EDTA (Chelating Agent), Limonene (Fragrance Ingredient), Sodium Hydroxide (pH Adjuster), Linalool (Fragrance Ingredient), Citral (Fragrance Ingredient), Citric Acid (pH Adjuster), CI 19140/Yellow 5 (Colorant), CI 42090/Blue 1 (Colorant). 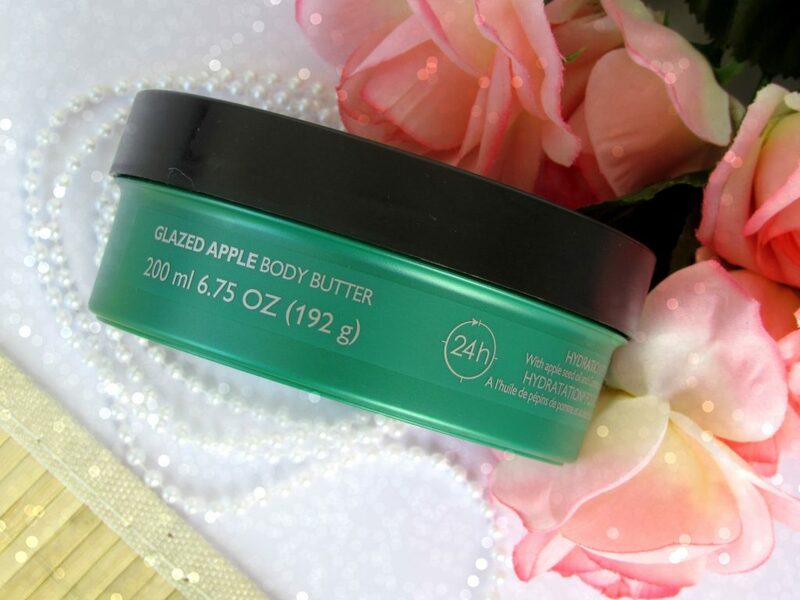 The Body Shop Glazed Apple Body Butter comes in the standard Body Shop Body Butter packaging – a big round plastic tub with a screw open lid. This was sent to me by the Body Shop PR. About the packaging, I feel the big tub makes it bulky to travel with. While travelling, I decant some of this to a small travel jar. I also feel the jar packaging makes it very unhygienic to use. I always need a spatula to scoop the product out. How I wish these traditional TBS butters came in tubes. Now, about the fragrance and moisturizing properties of this – It smells like candy + green apple and I quite like the scent. sweet notes and fruity tints in the right proportion. This is a scent that most people would like. Fragrance starts to fade after couple of hours of wear. It doesn’t leave the body greasy which is one factor that I like about it. It feels really smooth on the body. It has a buttery texture and upon application, it’s very refreshing and keeps the body hydrated for long. I tried this in summers as well as winters. I like it for summers as it’s non greasy. But, I would say- This is not really great for extreme winters unless you have a normal body area. If you are on the extremely dry skin side- I wouldn’t recommend this to you. Also, though they claim to be enriched with Community Trade Shea Butter, Cocoa Butter, Sesame Oil, Beeswax, Soya Oil, Babassu Oil, and Sugar – I see dimethicone in the ingredient list. These are not organic. if that bothers you- Better don’t buy this. But, if you want to experiment with a limited edition fragrance- go grab it; it’s available in some of the stores. Not sure as this is a limited edition one. Body Butters, Sorbets and shower gels are something that I reach out for again and again from body shop. Overall, if you’re looking for an effective body butter that smells great and comes from an ethical company, and keeps your body hydrated all day long (For normal body area) – This is it! Body Shop is against animal testing and it supports ethically sourced ingredients. That is one factor -Why I like getting products from them. Do keep in mind that companies like LUSH that are known to be “natural” and handmade also use artificial fragrances and colors for their products. Best Coffee Body Polish Ever! !